iOS 7.0: the beginning of the end for Apple? 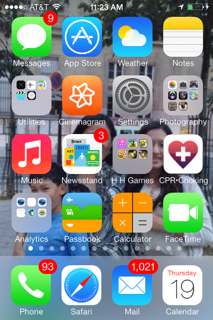 Home » GreatDad Blog » iOS 7.0: the beginning of the end for Apple? Our entire family has now downloaded the new iOS for iPad and iPhone. I should say to start out that I’ve been an Apple user since 1992, and one of the faithful few even during the dark days. Our love for Apple has always stemmed from the human side of the product, and what Steve jobs try to medicate with the slogan “the computer for the rest of us.” While “real” engineers have always promoted the openness of Microsoft, and recently of android, it was the operating systems of Apple products that made us users feel that we were the master of the device rather than the other way around. While I know many people in the past 10 years, since the beginning of Mac OS X, had sniggered about the faux leather look of applications like address book and calendar, these treatments, while I agree they are hokey, made us feel strangely secure in retrospect. When I look at my iPhone with a new iOS 7, I see a device that could easily be for Microsoft or from Google. Whether you like the new design are not, whether you like the flat colors or not, there is not a lot of humanity left in the design. Where former icons were made to amuse and delight–remember the joy to see it first snowing in the Weather app?– the new icons are now just visual treatments to communicate a concept. There are no icons for screens I’ve seen yet that make me smile, or appreciate the change. What is lacking also, is any type of brightness since all of the colors are so light and bright. In setup screens, is completely unclear where the important parts are; even in color, it almost looks monochromatic. On the second day after its launch, my family already wonders if there’s a way to go back to iOS 6. So far, we have found few features to make us glad we switched. My daughter likes the new Apple radio feature that mimics Pandora, with the potential to make lots of money for Apple. I like the fact that Safari now stores passwords. But these are not real game changers and could’ve easily been integrated into the last graphical interface. I have a nagging fear that this may be the beginning of the change everyone feared after Steve Jobs passed away. That without Steve, the company would sink to the temptations of the marketplace, milking as much cash as they can, and imitating the worst of their competitors. I have yet to read any other reviews expressing these opinions so my family may be alone in its revolt. Still, we now worry about the new OS X Mavericks coming out this fall and whether it will also start to destroy the relationship we have with our laptops.